Use the MODELA PRO II MDX-540 to make functional prototypes and industrial models quickly and with high precision. You may use the material of your choice for this purpose. Commonly used materials are ABS, POM, and polyurethane. The MDX-540 can also be used for milling aluminium and copper. Apart from prototypes, you can also use the milling machines to make small series of components and moulds. Production takes place using the SRP technology. SRP means Subtractive Rapid Prototyping. In this technique, prototypes are made by milling a certain shape ​​from a block. In additive systems, prototypes are made ​​by placing thin layers of materials one on top of the other. SRP has several advantages over additive systems: it is cheaper, supports more materials and can finish models excellently. You can keep your ideas confidential since you don’t need to outsource the production of prototypes. You will also save a lot of money and time. Furthermore, the device is easy to operate and the quality of the prototypes is high. Thanks to the precision spindle, the results are so precise that little or no finishing is required. The separate control panel allows you to operate the device from a safe distance. You can also set up and control the device via your PC with the virtual control panel. The device stops immediately on pressing the emergency button. An (optional) cover protects the milling system, thereby ensuring safety as well as the cleanliness of the surrounding area. 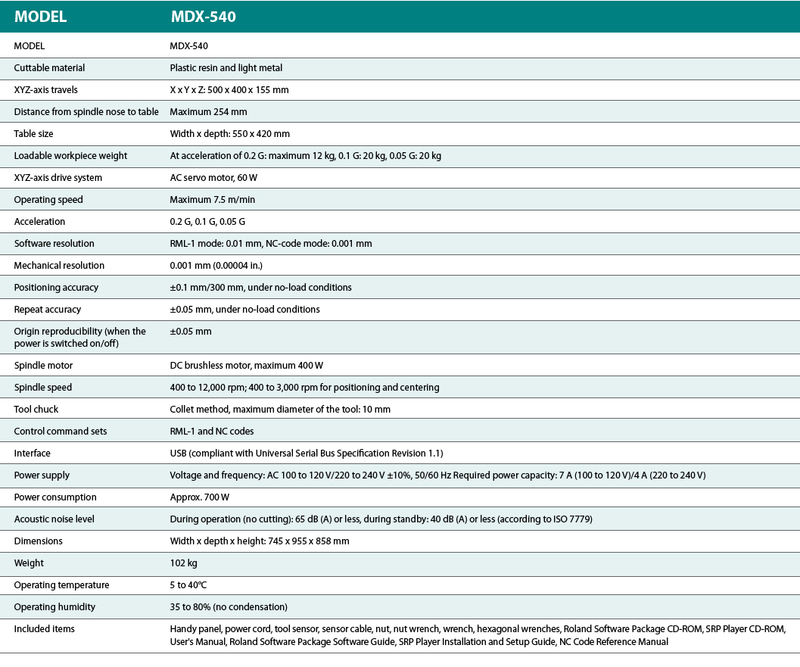 Four variants of the MDX-540 are available: the standard MDX-540, the MDX-540S, the MDX-540A, and the MDX-540SA. Each ‘A’ model is equipped with an automatic tool changer (ATC). The ‘S’ models deliver milling work of very high quality, important for prototypes and other applications in which fitting accuracies are important. The S models are equipped with an up to 0.02mm precise spindle. This gives you a very high repeat accuracy and minimal visible traces of the milling process. The optional rotary axis increases the flexibility of the MDX-540. This fourth axis enables you to mill your material on all sides. You therefore do not have to turn the material manually. The automatic tool changer (ATC) can also be supplied as an option. The ATC changes up to four different milling cutters and allows you to mill a prototype fully without the need for any intervention. This saves labour costs. The device is supplied with user-friendly software. You can deliver professional results in no time, even if you have no experience with modelling.